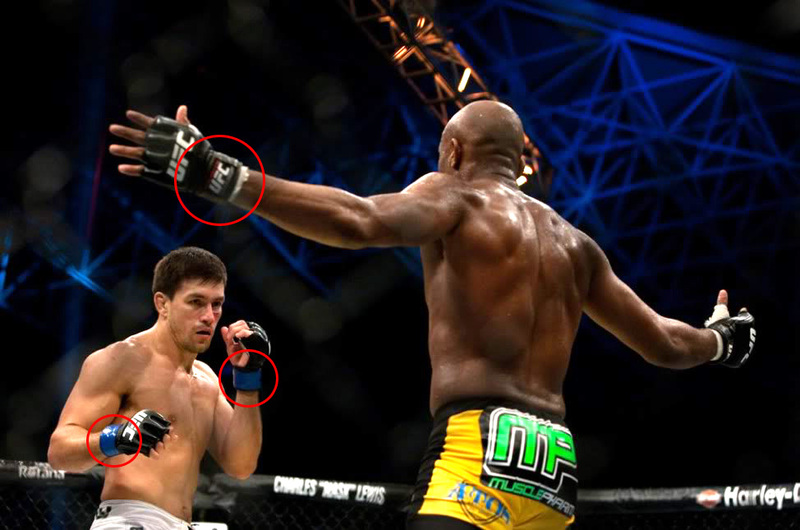 Doing a speedy double take while looking through images from UFC 112's fight night and reading through Sherdog's forums, and someone brought up the observation that Anderson Silva's hands weren't taped during the fight against Demian Maia. I was thinking no effing way, how could someone miss this? I'm not sure what they can do about this as I'm sure it's part of the ref's job to check over the fighter's mouth guard, cup, fingernails and gloves. This isn't an attempt at further scrutinizing Anderson Silva, as his fighting abilities show that he would have defeated Maia regardless of such details, but such procedures are strictly required to make the fight safe for both fighters. Although it probably didn't happen, taping of the gloves is also an added security towards the prevention of tampering with the gloves, which happens a lot throughout the history of boxing/MMA. Interesting stuff! -In all weight classes, the bandages on each fighter's hand shall be restricted to soft gauze cloth not more than 13 yards in length and two inches in width, held in place by not more than 10 feet of surgeon's tape, one inch in width, for each hand. -Surgeon's adhesive tape shall be placed directly on each hand for protection near the wrist. The tape may cross the back of the hand twice and extend to cover and protect the knuckles when the hand is clenched to make a fist. -The bandages shall be evenly distributed across the hand. -Bandages and tape shall be placed on the fighter's hands in the dressing room in the presence of the inspector and in the presence of the manager or chief second of his or her opponent. -Under no circumstances are gloves to be placed on the hands of a fighter until the approval of the inspector is received.